Let me just say that I have discovered a new favorite grilled vegetable - kale. Yep, grilled kale is amazing. Just de-stem, rough chop, toss with small amount of olive oil, salt and pepper and grill in a veggie grilling basket. You will get some pieces that are nice and crisp like kale chips, and others that are soft and so full of flavor. Such a fantastic combination of textures and flavors. So this brings me to last night's dinner - Grilled Kale and Veggie Pasta Salad. Jason actually did the grilling last night, which was a nice treat. He grilled the kale, squash, zucchini, red onion, red and green bell peppers. In the meantime, I cooked some whole-wheat rotini. After the veggies were done, he chopped them up and everything was tossed into a large bowl along with some cherry tomatoes. 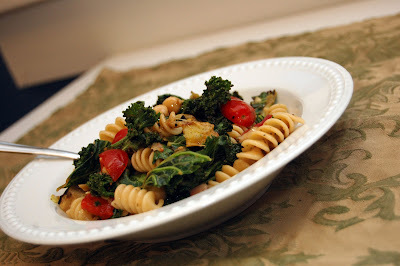 Jason made a simple Dijon balsamic dressing and poured that over the veggies and pasta, mixed well and served. This was a fantastic spring dish. There are so many options for veggies here too - but kale is a must. What's the oddest thing you've grilled? I love ketchup on any and all potatoes and grilled cheese sandwiches. Firmly believe salsa should always be offered as a salad dressing option. I am convinced that everything can indeed be grilled. Hate it when people try to whistle a tune - especially on an elevator. When a ceiling fan starts to make any noise at all, it should be replaced. I always worry that I have food stuck in my teeth and have no problem flashing my teeth to pretty much anyone to have them check for me. Dropping F-bombs is good for the soul. I believe I have a real addiction to peanut butter. I kind of wish wine didn't taste SO good. So what's something absolutely random for you? Hate whistlers? Curse like a sailor? Do tell.